Although the most important piece of equipment is our extensive understanding of and experience with various indoor air pollutants, our inspectors also use cutting-edge technology and industry-tested tools to reach unbiased conclusions during diagnostic inspections for mold, moisture, asbestos and other indoor contaminants. Our technicians are great, and our tools are even better! 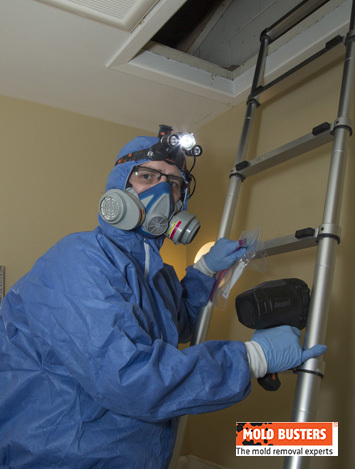 When it comes to mold inspections, we know that having the right equipment with us during the initial inspection is crucial to understanding hidden problems that may be affecting the indoor air quality of your home or office. The right combination of technology, experience and education helps us to confirm or deny the existence of any issues that need to be resolved. A moisture meter is a handheld device used for the detection of moisture in surfaces like flooring, drywall and ceilings. These precise tools help to non-invasively detect the presence of active or residual moisture within a building material. 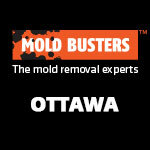 When water is present within an organic-based material like drywall or wood, mold can form within 24 to 48 hours. Finding an active water source in your home can be the first step in resolving a serious issue! Our moisture meters do not penetrate the material. Instead, they use a rapid, non-invasive method (usually radio frequency) to determine the relative moisture level below the surface of a material. 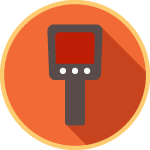 This allows them to scan large areas relatively quickly without causing any damage to your property. 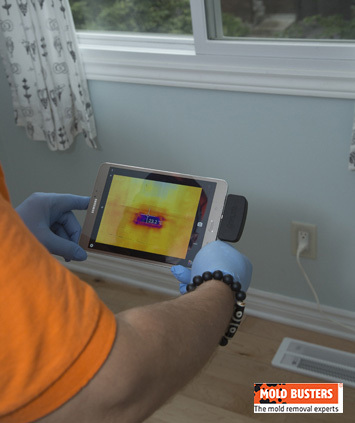 Perhaps our most impressive piece of equipment, an infrared camera makes inspecting for mold faster, safer, cheaper and more accurate than most other methods. 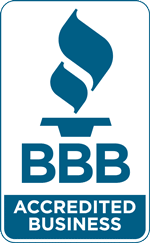 Our inspectors no longer need to crawl into every corner of your home, looking for black mold or leaky pipes leading to mold. Using an infrared camera, they simply scan the area in question and wait a few moments for the camera to produce a thermogram. A thermogram is a display of colours representing the various heat signatures of all objects and surfaces in the camera’s view. Red indicates warmer temperatures, while blue indicates cooler temperatures. 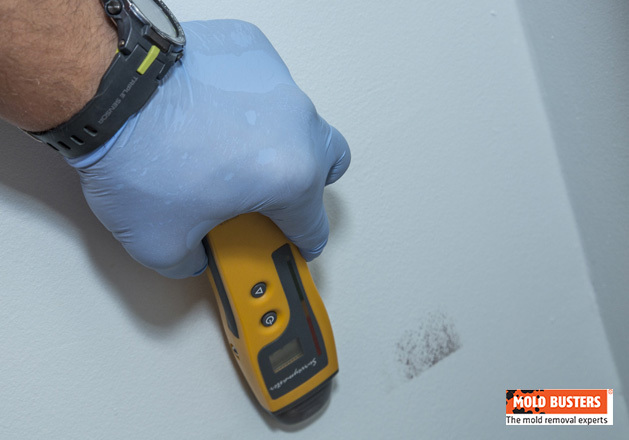 As long as the technician behind the camera is a certified thermographer who is able to interpret the results properly, he or she can pinpoint exactly where moisture and humidity levels are higher than normal, which puts you at risk for mold. What’s more, we’ll do zero damage to your beautiful home. Because the infrared camera is so precise, there’s no need to break down walls or lift floor boards to find problems. A hygro-thermometer is a device that measures both the temperature and moisture content of air simultaneously in order to calculate relative humidity (RH). Warmer air absorbs more moisture, so the relationship between temperature and relative humidity is a direct one. And the higher the relative humidity, the greater the chances of mold. 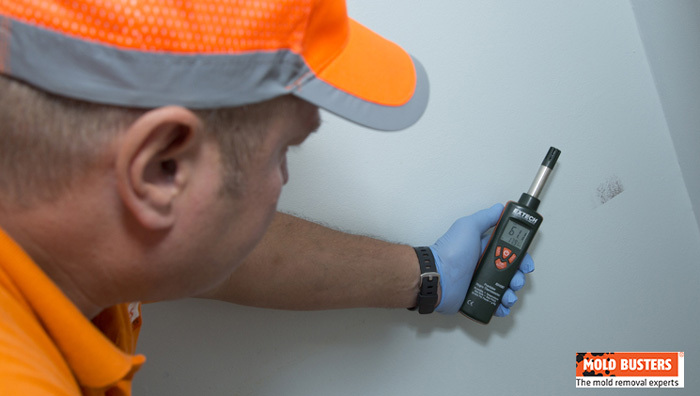 We use robust, highly accurate hygro-thermometers in every mold inspection to give us a better understanding of your indoor environment and to determine whether conditions are favorable for mold growth. Hygro-thermometers also measure dew point, the temperature at which moisture in the air will condense and form dew or frost. This is important because it shows how much moisture is in the air. The higher the dew point, the more saturated the air is with moisture. Obviously, when trying to prevent mold, we want to keep humidity to a minimum, which is why it is important to monitor not just temperature and relative humidity, but also dew point. Particle scanners are used to assess air quality by counting and sizing the number of particles in the air. 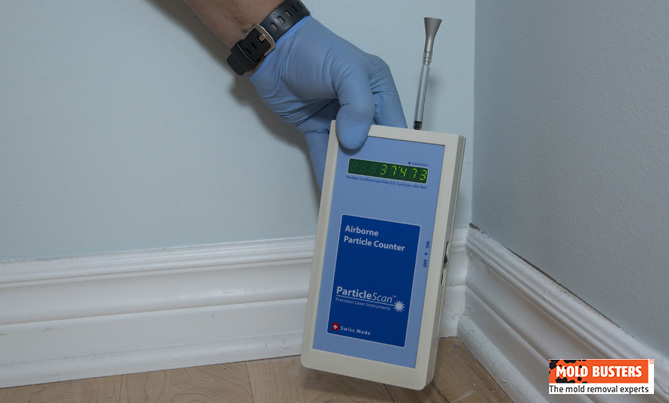 A reading taken from a room with a mold problem typically reveals a high number of particles that are 2 to 20 microns in size. These handheld tools are therefore very useful in determining the amount of pollutants inside a building and in understanding the cleanliness level in a controlled environment. 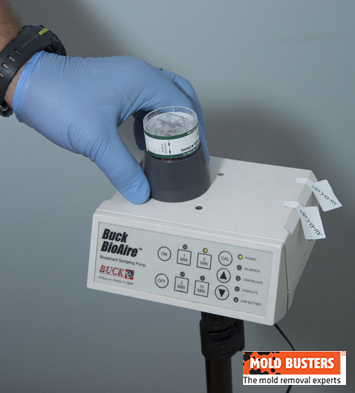 At Mold Busters, we perform a particle scan as a precursor to an air quality assessment, to help identify areas where air sampling may be beneficial. Air sampling pumps are used when you want to test your indoor air for the presence of various pollutants like asbestos, mold and other fungi. While there are many makes and models of air sampling pumps, they all generally do the same thing: collect samples of indoor air at various flow rates and compress it into a small cassette (Air-O-Cell® or Via-Cell®). The sample is then immediately shipped to an accredited laboratory for detailed analysis, which reveals the type and concentration of microorganisms present in the air sample. 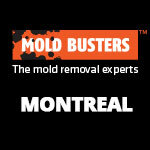 At Mold Busters, we use air sampling pumps for viable and non-viable testing for mold and asbestos. This is one of the best ways to assess indoor air quality and identify today’s most common contaminants. Our instant swab test for mold is a simple test that takes only seconds to perform and give results. We use 3M Clean-Trace Surface Protein Plus swabs to help assess the potential for biological contamination on surface areas. These tests also serve as indicators for laboratory analysis sampling and/or establishing disinfection recommendations. 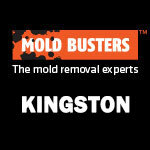 Mold Busters offers a free mold swab test during the mold inspection if our inspectors deem it necessary. The inspector collects a sample by rolling the swab gently over the suspected surface. He then returns the swab in the tube and twists the cap firmly shut. Within seconds the results are ready, showing whether or not the surface tested has mold growing on it. Although instant swab tests provide very quick results, they cannot be used to speciate mold types, understand toxicity levels, or establish hazard levels on surface areas. 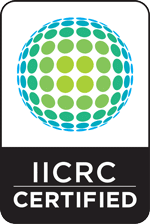 Any type of positive reaction to instant swab tests are only indicators of potential issues. That said, mold swabs are perfect for testing hard-to-reach areas or for wet surfaces that cannot be tested using a tape lift. Learn more about swab testing for mold. A tape lift is a method used to test a specific area for mold. To collect a sample, we press the adhesive side of a piece of tape over the area in question and gently pull it off. Samples collected using the tape lift method are sent to an accredited microbiological laboratory for testing. 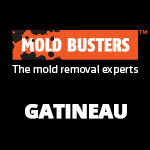 The results provide information on the types and concentrations of mold present on the sample. Similarly to swab tests, tape lifts for mold cannot be used to assess the overall health of the indoor environment as they provide information only on the surface tested. Learn more about mold tape lifts. A common non-destructive testing method, borescopes are snake-like devices that have a camera on one end and an eyepiece on the other. They are most commonly used during visual assessments to inspect the interior of small, otherwise inaccessible areas without causing destructive damage to the structure. What makes borescope such a valuable addition to our toolbox is their flexibility, which gives us access to some of the smallest, darkest, most hard-to-reach places in a building. Smoke pens emit dense white smoke that reacts readily to even the smallest of drafts, making it easy for our inspectors to locate air leaks around windows, doors and chimneys. We use smoke pens regularly to detect inefficient or malfunctioning ventilation systems as well as heat loss due to poorly sealed windows and doors. Best of all, this smoke is completely safe and non-toxic so it won’t pose a risk to your health. Most people can’t believe how something as simple as good lighting is crucial to diagnosing problems and recognizing potential threats to your property. This is why Mold Busters inspectors always carry high-powered flashlights and UV lights in their toolbox when inspecting dark places like crawl spaces, attics and cold storage rooms. Our high-intensity UV lamps are portable, easy to set up and provide 3,000 to 5,000 lumens of illumination. In order to ensure accuracy in our scope of work assessments, we rely on advanced laser rulers when measuring areas affected by mold. This may seem trivial, but having exact measurements of contaminated areas allows us to precisely schedule remediation work, not to mention calculate costs, estimate material needs and provide customers with the lowest possible quotes. Have you ever noticed that mold tends to grow on the north side of buildings? Strange but true. The logical explanation for this is that, in the northern hemisphere, the south side gets more sunlight, which allows water to evaporate and moisture to dry faster. Meanwhile, the north side is cooler and damper, providing the perfect conditions for mold growth. A compass is therefore a great addition to the Mold Busters toolbox as it allows our inspectors to conduct thorough assessments of areas that are known to be more prone to mold contamination. Personal protection equipment, or safety equipment, is essential in every mold inspection and mold remediation. Every jobsite has the potential for danger—we may unexpectedly uncover a hazardous material like asbestos, black mold, or even dead animals (believe us, it’s happened!). In order to guarantee the safety of our inspectors and technicians, we make it a rule to wear protective gear such as respirators, full-body suits, gloves, goggles and hard hats at jobsites no matter how big or small the project is.